KE00115 is a solid phase sandwich Enzyme Linked-Immuno-Sorbent Assay (Sandwich ELISA). 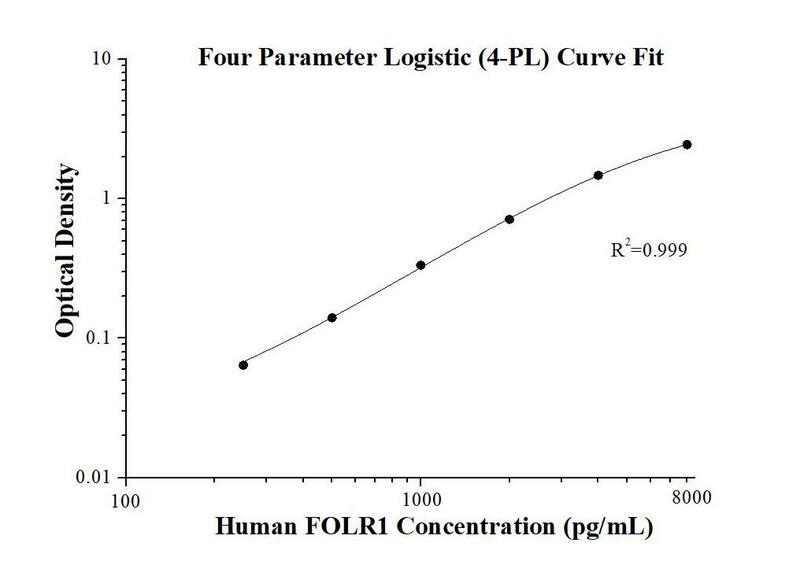 The human FOLR1 ELISA kit is to be used to detect and quantify protein levels of endogenous human . The assay recognizes human FOLR1. A monoclonal antibody specific for human FOLR1 has been pre-coated onto the microwells. The human FOLR1 protein in samples is captured by the coated antibody after incubation. Following extensive washing, a polyclonal antibody of biotinylated specific for human FOLR1 is added to detect the captured human FOLR1 protein. For signal development, Streptavidin-HRP is added, followed by Tetramethyl-benzidine (TMB) reagent. Solution containing sulfuric acid is used to stop color development and the color intensity which is proportional to the quantity of bound protein is measurable at 450nm with the correction wavelength set at 630 nm. Folate receptor 1 (FOLR1), also known as folate receptor alpha or adult folate-binding protein (FBP), is a 38-kDa glycoprotein belonging to the folate receptor family. The receptor binds to folate and reduced folic acid derivatives and mediates delivery of 5-methyltetrahydrofolate to the interior of cells. FOLR1 is a secreted protein that either anchors to membranes via a glycosyl-phosphatidylinositol linkage or exists in a soluble form. FOLR1 expression is often limited to the apical surfaces of epithelium in the lung, kidney and choroid plexus but is differentially overexpressed in a variety of solid tumors such as ovarian cancer, non-small cell lung cancer, breast cancer, kidney cancer and high-grade osteosarcoma.